At Optimum Moving, our top priority is to make the moving process safe and hassle-free for our clients, whether it is a large scale move or a small move. We will always make sure that all your valuable items reach the destination without damage. Allow us to meet your relocation needs in Haddonfield, whether you are moving in or out! With a population of more than 11,000 and a total area of 2.87 square miles, Haddonfield is situated in Camden County and was once occupied by Lenni Lenape Native Americans. It is a historical paleontology site where the first complete skeleton of a dinosaur was dug out by William Foulke. The Indian King Tavern is another historical site, which is currently a popular museum in the area. In Haddonfield, renters constitute 18% of the entire population and continue to live in the same house for at least a year. The owners of houses and condos tend to stay in the same house for a period of 14 years on average in this city. 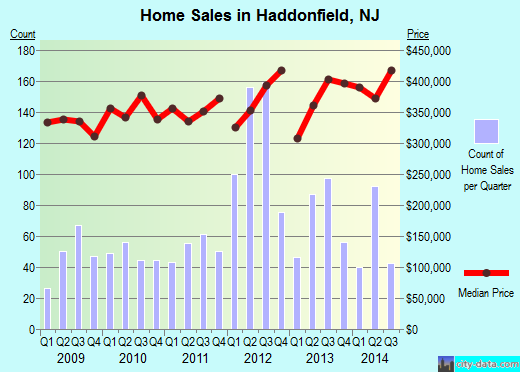 The median price of a house in Haddonfield is around $412,877, and it usually features three to four bedrooms. At Optimum Moving, customer satisfaction is our top priority and we make sure that your belongings are transported in a safe and secure manner. We have containers, dollies, and many other moving supplies to handle all sorts of moves. No job is too small or too big for our team of professional movers. Even though we maintain a high quality for our moving services, you can be assured that our moving rates are among the lowest in New Jersey. Try us today for a hassle-free relocation in Haddonfield! Want to learn more about a Haddonfield Move?